Child safety is of paramount importance for PASC. We are affiliated to Swim Ulster and Swim Ireland and are guided by them in how best to ensure that we put child safety first. 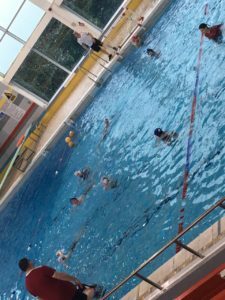 Swim Ireland require that all aquatic activities involving children and young people must be supervised and for any activity the welfare and safety of the child must be put first. Swim Ireland require that each club have a Parent Supervision Rota, a copy of the Supervision Policy is on the notice board, please take time to read it. “A safe environment can only be created when everybody in the Club works together to put safeguards in place for everyone’s protection. Parents/guardians must also understand that they have an important role in implementing safe practices for their children and be willing to help”. Sign into the PASC Parent Supervision Rota diary and to speak with the coaches taking the session. Take note of children leaving and returning to pool, e.g. a child should return to the pool after visiting the toilet. Allow the coach/teacher freedom to get on with the session – sometimes coaches or teachers need to feedback to individuals on one to one basis, this should be in open view. Take note of any problems that occur – refer child related issues to the Club Children’s Officer/all other issues to Committee, usually the secretary. Have temporary access to children’s contact details in cases of illness or emergency or in the event the session is cancelled. In cases of emergency, help the coach/teacher by being an extra adult to supervise children or to assist with a response to the emergency. Ensure an attendance record for the session is kept – this can be kept with the coach and should be signed by the coach and supervisor. It is the Parent Supervisor’s responsibility to arrive on time for the session and to arrange alternative cover should they not be able to make it. 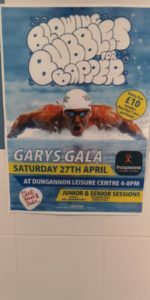 Following Swim Ulster guidance (please see full policy on notice board for more detail), the Parent Supervision Rota will not include Cascade Changing Rooms. There may, however, be circumstances where children need extra assistance or there is an issue, in which case supervision in pairs is required in the changing rooms. In an emergency circumstance the safety and well-being of a child must be considered above all else.